The Sourcebook for Political Communication Research will offer scholars, students, researchers, and other interested readers a comprehensive source for state-of-the-art/field research methods, measures, and analytical techniques in the field of political communication. The need for this Sourcebook stems from recent innovations in political communication involving the use of advanced statistical techniques, innovative conceptual frameworks, the rise of digital media as both a means by which to disseminate and study political communication, and methods recently adapted from other disciplines, particularly psychology, sociology, and neuroscience. Chapters will have a social-scientific orientation and will explain new methodologies and measures applicable to questions regarding media, politics, and civic life. 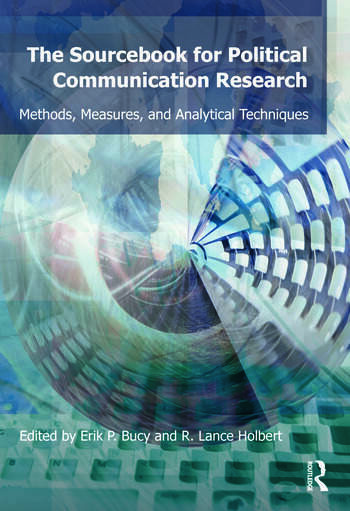 The Sourcebook covers the major analytical techniques used in political communication research, including surveys (both original data collections and secondary analyses), experiments, content analysis, discourse analysis (focus groups and textual analysis), network and deliberation analysis, comparative study designs, statistical analysis, and measurement issues. Erik P. Bucy (PhD, University of Maryland, College Park, 1998) is an Associate Professor of Telecommunications and Adjunct Associate Professor in the Department of Political Science and School of Informatics at Indiana University, Bloomington. Bucy is the editor of Politics and the Life Sciences, and author, with Maria Grabe, of Image Bite Politics: News and the Visual Framing of Elections (Oxford, 2009). Bucy serves on the editorial boards of Human Communication Research, The Information Society, and Mass Communication and Society. He has held visiting and research appointments at the University of Michigan and Dartmouth College. R. Lance Holbert (PhD, University of Wisconsin-Madison, 2000) is an Associate Professor in the School of Communication at The Ohio State University. He is the author of several articles on the use of structural equation modeling in the communication sciences. His most recent research has appeared in Journal of Communication, Communication Research, Communication Monographs, and Media Psychology. He serves on many editorial boards, including Journal of Communication, Communication Monographs, and the Journal of Broadcasting & Electronic Media.